Hematopoietic stem cell transplantation (HSCT) is currently an important strategy for the treatment of many hematological disorders, but the efficacy and safety are frequently limited by concomitant immunologic derangement. Although considerable attention has been focused on how to prevent the detrimental Acute Graft-Versus-Host Disease (aGvHD) while protecting the desired Graft-Versus-Leukemia (GvL) effect, recipients remain susceptible to the other life-threatening post-transplantation complications, including Chronic GvHD (cGvHD), Intestinal GvHD (iGvHD), Transplantation-Related Mortality (TRM), and hematological relapse. Thus, defining variables that predispose to any of these events are of critical importance. During recent years, many studies have provided convergent lines of evidence for a link between Single Nucleotide Polymorphisms (SNPs) from specific genes and HSCT outcomes. The nucleotide-binding oligomerization domain containing 2 (NOD2) gene, previously known as the caspase recruitment domain 15 (CARD15) gene, is one such candidate gene. The NOD2 gene is located in humans on chromosome 16 (16q21). It has a C-terminal leucine-rich repeat region for sensing microbial products, a central nucleotide-binding domain (NACHT), and an N-terminal CARD (caspase activation and recruitment domain). In antigen-presenting cells, NOD2 expression leads to downstream activation of innate pathways of host defense when triggered by its interaction with Muramyl Dipeptide (MDP), a component of gram-positive and -negative bacterial cell walls, subsequently leading to the activation of the pro-inflammatory NF-κB pathway. Several studies have identified three NOD2 SNPs (Arg702Trp, SNP8; Gly908Arg, SNP12; Leu1007fsinsC, SNP13) as being associated with increased incidence and severity of aGvHD, increased TRM, and reduced Overall Survival (OS)[6,7]. Although SNPs 8, 12, and 13 are thought to reduce the ability of MDP to activate NOD2 and consequently the activation of NF- κB, resulting in reduction in the production of cytokines and antimicrobial peptides, these loss-of-function effects caused by the SNPs initially proved controversial, as an enhanced cytokine response is characteristic of GvHD. Naturally, other studies have yielded inconsistent results[8,9], possibly due to limited sample size, differences in genetic background within a transplant pair, and variable study designs[3,10,11]. Here, a comprehensive search and meta-analysis were used for the first time to confirm the association of differential NOD2 polymorphism status in Caucasian ethnic populations with HSCT outcome. References from electronic databases including PubMed, Ovid and the Web of Science were systematically searched for all potentially relevant studies published in English. Searches were performed to identify relevant references in the databases up to and including the date of March 1, 2014. Various combinations of the following medical subject headings (MeSH), terms, and key words were used: “NOD2/CARD15”, “polymorphism/mutation/variant”, “graft-versus-host disease/GvHD” and “hematopoietic stem cell transplantation/HSCT”. The reference list of the retrieved articles was further screened manually to find potentially eligible publications. When necessary, authors were contacted for specific raw data to obtain sufficient clarification. Where overlapping study populations existed, only those of the longest follow-up with sufficient data were selected in order to avoid data duplication. Published genome-wide association studies (GWAS) addressing the influence of NOD2 gene status on GvHD were also identified. Two investigators independently extracted and evaluated the data, and disagreements were resolved by discussion until a consensus was reached. No previous meta-analysis for association of NOD2 SNP with GvHD was found. The inclusion criteria were the following: (1) observational studies concerning the association between NOD2 gene polymorphisms and at least one complication after HSCT; (2) studies in English providing relative risk (RR) and 95 % Confidence Interval (CI) data; (3) studies were designed as cohort or case-control investigations; (4) studies were performed on adults or children, and no restrictions were placed on nationality or ethnicity; (5) primary endpoints were occurrence of Acute GvHD (aGVHD), Chronic GvHD (cGVHD), Intestinal GvHD (iGVHD), Transplantation-Related Mortality (TRM), Overall Survival (OS), Disease-Free Survival (DFS, defined as patients alive at last contact and no evidence of relapse), and hematological relapse. Mild cases of GvHD in recipients were defined as grade I/II and severe cases as grade III/IV, according to the NIH classification scheme. 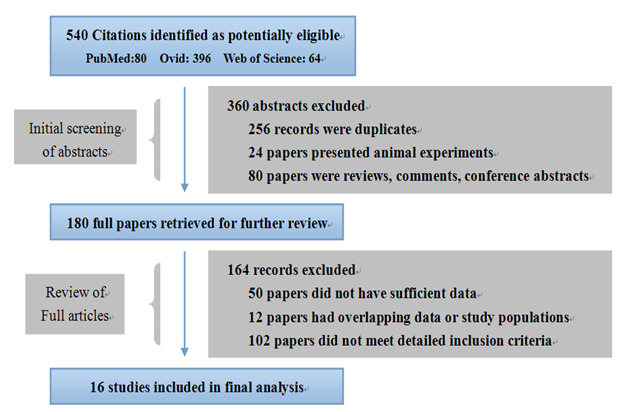 References were excluded based on the following criteria: (1) reviews; (2) animal experiments; (3) noncomparative studies with no original data; (4) duplicate study populations; (5) unavailable datasets. Two reviewers independently extracted eligible datasets, utilizing the predesigned data collection form. The following information where available was recorded for each trial: first author, publication year, study characteristics relating to demographics, numbers of cases and controls, graft source, underlying disease, conditioning regimen, HLA match, follow-up, immunosuppressive protocol, detection methods of NOD2 polymorphisms, the genotype of the NOD2 polymorphisms and the number of patients or donors with the SNPs, and outcome as defined under eligibility criteria. Population stratification was conducted according to the NOD2 SNP status in transplant pairs. Additionally, if independent results from the separate study populations were reported by the same author and met the inclusion criteria, all of them were included and labeled but distinguished on the basis of the year of publication. Disagreements were resolved by discussion with a third reviewer. Quality assessment was independently undertaken by at least two investigators according to the published Quality Assessment for Studies of Diagnostic Accuracy Statement (QUADAS). QUADAS is an evidence-based quality assessment tool for use in systematic reviews of diagnostic accuracy studies. The QUADAS tool includes 14 items assessing risk of bias, sources of variation, and reporting quality. Each item is rated “yes”, “no”, or “unclear”. The maximum score of the QUADAS system is 14, and potential discrepancies are resolved by a third party. The statistical analysis was performed with Freeware Program Review Manager (Version 5.0). The predictive performance of NOD2 was assessed with a summary receiver operating characteristic (SROC) curve on Meta-DiSc software ( http://www.hrc.es/investigacion/metadisc_en.htm). 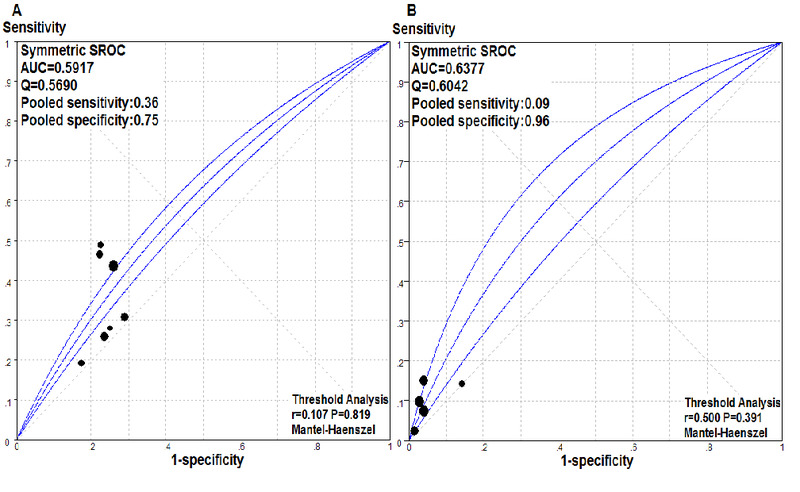 Pooled sensitivity and specificity values together with the area under the summary ROC values (AUC) were also calculated. RR and the 95 % CI were used to assess the strength of the association between NOD2 gene polymorphisms and complication susceptibility after HSCT. The online software HWE (Hardy-Weinberg equilibrium) (http://ihg.gsf.de/cgibin/hw/hwa1.pl) was used to evaluate the deviation of genotypes from Hardy-Weinberg equilibrium (HWE) in controls. A Fisher’s exact test was used to analyze deviation of the distribution of individual genotypes from HWE in control groups. Heterogeneity was measured by χ² -based Q testing and I² statistics, where I² between 0% ~ 40%, means might be important, 30% ~ 60%, indicated moderate heterogeneity, 50% ~ 90% indicated substantial heterogeneity. A fixed- or random-effects model was used depending on the absence or presence of significant heterogeneity, respectively. Furthermore, a sensitivity analysis was conducted by excluding any single study whenever significant heterogeneity was indicated. Subgroup analysis was conducted according to the severity of GvHD (mild, I/II; severe, III/IV) to determine the effect of the NOD2 genotype. Data concerning different NOD2 SNP genotypes were also treated as separate studies in the subgroup analysis using the model of per-genotype versus wild-type gene. Study-specific results were assessed by forest plots. P-values were two-sided, and a P-value < 0.05 was considered significant. Finally, asymmetry in a funnel plot of log (RR) plotted against RR was used as a measure of publication bias. The study selection process is shown in Figure 1. Briefly, a total of 540 potentially relevant articles were systematically identified after an initial search. Abstracts only were screened first, and 360 articles were excluded due to duplicated studies, animal experiments, or review articles. A further 164 records were subsequently excluded, due to insufficient data, and overlapping or ineligible data, based on examination of the content of the complete texts. One final search indicated that there were no published GWAS addressing the association of NOD2 polymorphisms with various HSCT outcomes. In conclusion, a total of 16 studies, including four case controls and 12 cohort studies, were considered for pooled analysis. Figure 1: Literature flow chart. PubMed, Ovid, and the Web of Science were searched for eligible studies published up to and including the date of March 1, 2014. The final 16 studies were chosen according to the criteria outlined. The detailed baseline characteristics of the 16 included studies are shown in Table 1. The ethnicity of all populations in the final 16 studies was Caucasian. The distribution of the genotypes of the controls was consistent with HWE except in four studies. Of these 16 studies, 14 were pooled for evaluating the association between NOD2 polymorphisms and GvHD severity, while eight were individually assessed for unilateral recipient-, unilateral donor-, or bilateral side associations. Only three papers of the 16 reported an association between NOD2 SNP8/SNP12/SNP13 and HSCT outcome. The overall quality of the study design was acceptable and displayed a mean QUADAS score of 8 ± 3 (Mean ± SD). Table 1: Baseline characteristics of the included studies. PB, Peripheral blood stem cell; BM, Bone marrow; HWE, Hardy-Weinberg Equilibrium; MFD, Matched family donor; MUD, Matched unrelated donor; MRD, Matched related donor; MMD, Mismatched donor; FK, Tacrolimus; CsA, Ciclosporin A; MTX, Methotrexate; MMF, Myeophenolate- Mofetil; Pred, Prednisone; GvHD, graft-versus-host disease. GvHD association with NOD2 polymorphisms in donors or recipients or both NOD2 polymorphisms have been most strongly associated with the risk of GvHD after HSCT. GvHD was therefore investigated first as the endpoint in individuals or recipient-donor pairs, where any NOD2 polymorphisms were present, compared to the outcome of wild-type (wt) recipient/donor pairs. For severe aGvHD, an effect of NOD2 polymorphism was clearly observed (RR: 1.51, 95 % CI: 1.14 - 1.99, P = 0.004). NOD2 polymorphisms in either the donor or the recipient were associated with an increased risk of severe GvHD in recipients compared to wt SNPs, despite obvious between-study heterogeneities found in both analyses (I = 63 % ). No remarkable trend towards increasing but milder severity of aGvHD was observed when it was the recipient bearing a NOD2 SNP as opposed to a wt genotype (RR: 0.95, 95 % CI: 0.85 - 1.06, P = 0.33). Also, there were no significant differences in iGvHD (RR: 1.01, 95 % CI: 0.92 - 1.12, P = 0.79) and cGvHD (RR: 1.29, 95 % CI: 0.83 - 2.03, P = 0.26) regardless of the NOD2 genotype status in recipient and/or donor (Figure 2A, Table 2). Figure 2: Forest plots for the association of hematopoietic stem cell transplantation outcomes with NOD2 polymorphisms carried by the donor and/or recipient. For each study, the estimate of RR and its 95%CI is plotted as a box and a horizontal line. Filled diamonds are the pooled RR and its 95%CI. TRM- transplant-related mortality; DFS- disease-free survival; OS- overall survival. Table 2: outcome relative to NOD2 polymorphism status in donor or recipients. Any side: polymorphisms in any side of transplant pairs; R-side, polymorphisms in recipients only; D-side, polymorphisms in recipients only; Both side, polymorphisms of both R & D; aGvHD, acute GvHD; TRM, transplant-related mortality; DFS, disease-free survival; OS, overall survival. Figure 3: Forest plots for the detailed analysis of mild aGvHD and severe aGvHD relative to donor and recipient NOD2 polymorphisms. For each study, the estimate of RR and its 95%CI is plotted as a box and a horizontal line. Filled diamonds are the pooled RR and its 95 % CI. R-side, polymorphisms in recipients only; D-side, polymorphisms in donors only; both-side, polymorphisms in both R and D.
Analysis was subsequently performed on the data but with separation of the polymorphisms according to their occurrence in recipients (R), donors (D), or both (RD). Firstly, for severe aGvHD, the highest risk was observed in transplant pairs in which both recipient and donor carried a NOD2 polymorphism relative to RD-wt (RR: 1.87, 95 % CI: 1.25 - 2.80, P = 0.002; Figure 3, Table 2). 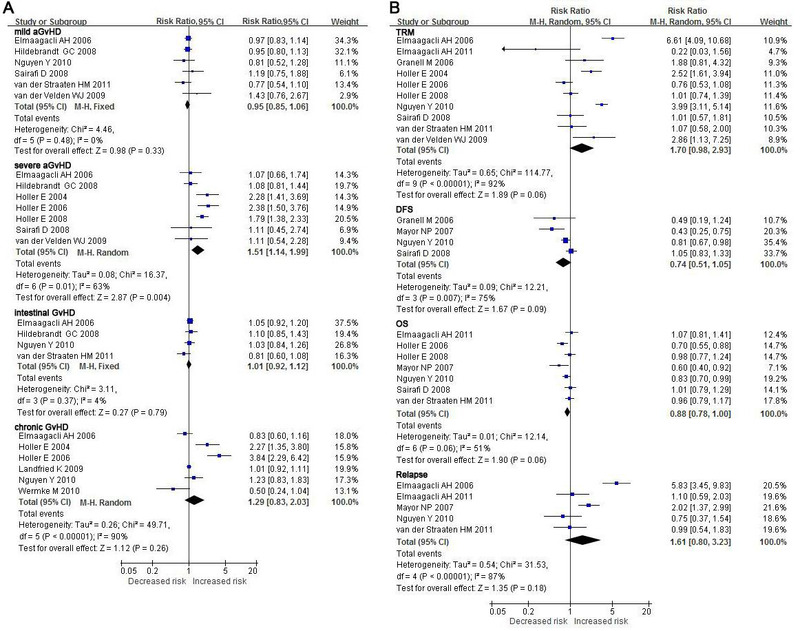 Only a slight increase in risk was observed when D-only was compared to RD-wt, although the P-value was marginal (RR: 1.42, 95 % CI: 0.94 - 2.15, P = 0.09). However, no such association was observed when R-only was compared to RD-wt (RR: 1.11, 95 % CI: 0.68 - 1.82, P = 0.68). This result indicated that severe aGvHD was a significantly increased risk in patients with NOD2 polymorphisms on the donor side. Secondly, for mild aGvHD, the surprising result was that the risk of mild aGvHD was not significantly associated with NOD2 SNP variants wherever they occurred (R- or D-only or both-side; all P-values > 0.05). To further investigate the association of NOD2 SNPs with the occurrence of GvHD as well as to potentially gain insight into the functional significance of the association, subgroup analysis of individual NOD2 polymorphisms was performed. Three of the studies from our search had evaluated individual NOD2 SNPs that were included in this meta-analysis[10,11,18]. Because of the existing heterogeneity, a random model of analysis was used. Although comprehensive analysis demonstrated that patients receiving a transplant from a NOD2 SNP donor had a higher aGvHD risk (RR: 1.55, 95 % CI: 1.06 - 2.25, P = 0.02), there was no evidence that the increased risk of GvHD associated with SNPs differed between the three individual NOD2 SNPs. These results therefore further substantiated that any NOD2 SNPs present on the donor-side increased risk of GvHD in recipients after HSCT. Table 3: Detailed analysis of the association between NOD2-SNP genotype and aGvHD. Figure 4: Predictive value of NOD2 status for severe acute GvHD. Summary receiver operating characteristic (SROC) curves for the presence of any NOD2 variant alleles in either- (recipient or donor) (A) or both-side (B) of transplant pairs as a predictor of severe aGvHD after allogeneic hematopoietic stem cell transplantation. AUC, area under the SROC values; Q, Youden’s index. Our results demonstrated that while NOD2 SNPs on either side of transplant pairs conferred a greater risk of severe aGvHD, such a predictive effect became even stronger when the SNPs occurred on both sides. SROC was next performed to determine the sensitivity and specificity of the SNP status for severe aGvHD with regard to the predictive value of NOD2 genotyping. The sensitivity and specificity of the presence of any NOD2 polymorphism that was carried by R- or D-, or R and D-sides of transplant pairs for severe aGvHD in each study are displayed in an SROC diagram (Figure 4). The sensitivity of any SNP in the recipient or the donor, or both in predicting severe aGvHD was 36 % and 9 %, with specificities of 75 % and 96 %, respectively. The AUC was 0.59 and 0.60 for severe aGvHD, which was consistent with a poor predictive accuracy and indicated a potentially causal association existed between NOD2 SNPs and GvHD. One of the parameters that may obscure an underlying susceptibility to GvHD in meta-analysis is heterogeneity across clinical studies, such as patient symptoms and treatment protocols. Significant heterogeneity was observed in severe aGvHD and cGvHD in the context of R- or D-side NOD2 polymorphism, where the heterozygote comparison was I² > 50 %. Sensitivity analysis for the case of R-side only polymorphism indicated that the study by Wermke et al was the main source of heterogeneity under a random effects model. After excluding this study, the heterogeneity was significantly decreased. Similarly, the study by Holler 2004 et al was the main source of heterogeneity in the case of D-only and RD-polymorphism analysis. However, for most comparisons for the status of NOD2 SNP genotype where GvHD was the outcome, no obvious heterogeneity was observed (I² < 50 %). In contrast, significant heterogeneity was observed in most comparisons for other HSCT outcomes. This heterogeneity could not be fully explained by the study design and subgroup analysis but might result from variation in the standards for evaluation for outcome. In sensitivity analysis, the combined results were recalculated by omitting one study per iteration. The summary estimates for most of the outcomes were similar in the absence of large fluctuations, demonstrating that the results of the meta-analysis were robust. Finally, the funnel plot illustrated that none of the included studies lay outside of the 95 % CI boundaries, indicating that there was no publication bias in the report of results on the NOD2 polymorphism and HSCT outcome (data not shown). Previous individual studies evaluating the association between NOD2 SNPs and HSCT outcome have yielded inconsistent results. Our strategy was to use meta-analysis due to its statistical power in order to potentially reduce between-study heterogeneity in the characteristics of transplant pairs, differential immunosuppressive protocols and transplant techniques that may obscure a real susceptibility to GvHD. Our study, taken together with all currently available published data, indicates that HSCT patients with NOD2 SNPs on the donor side appear to be associated with an increased risk of severe GvHD. The association is especially strong in the case of both recipient and donor of transplant pairs carrying NOD2 SNP/mutation. However, no significant association was observed in terms of mild GvHD. These results provide a strong argument that NOD2 polymorphisms have predictive value in HSCT outcome. The results from the meta-analysis confirmed previous reports that NOD2 polymorphisms were significantly associated with severe GvHD risk, but not mild GvHD. It is possible that the NOD2 gene plays different roles in the development of GvHD. For example, NOD2 variants may contribute to the onset of GvHD to varying degrees by interrupting the so-called cytokine storm that is necessary for initiating the syndrome. The disruption of the cytokine storm at an early stage posttransplantion would result in the absence of a GvHD response. However, mutated NOD2 proteins have been shown to have a reduced ability to recognize peptides with which NOD2 normally interacts, such as MDP. This deficiency in NOD2 leads to weaknesses in the integrity of the mucosal barrier and subsequently increased circulating levels of the bacterial peptide which trigger a state of hyper-inflammation with the eventual development of severe GvHD. The results of this study further confirmed that NOD2 polymorphism on the donor side was more significantly associated with detrimental post-HSCT outcomes than when on the recipient side. A possible explanation for this apparent status-dependent effect is that advances in transplant techniques and practice have mainly focused on the recipients, which results in similar survival prospects for patients of well-matched donors in HSCT. A bias is thus inherent in the transplant pair population so that the donor source rather than the recipient may contribute to the differences in HSCT outcome. In a second scenario, the recipients APCs which express NOD2 are possibly damaged during the conditioning regimen. In this scenario, the number of foreign donor APCs would appear to correlate more significantly with HSCT outcome because of the manner in which cross-presentation occurs. However, a minor impact of the presence of NOD2 SNP in the recipient simply might not be detectable. The question of whether specific NOD2 SNP genotypes (SNP8/SNP12/SNP13) affected the risk of GvHD was also examined to provide further insight into the functional nature of the association. Subgroup analysis of all available data documented that while the presence of any NOD2 SNP in donors and/or recipients was associated with a higher risk of GvHD, it was not specific to any particular SNP. Therefore, the mechanisms underlying the functional irregularities attributed to NOD2 SNPs appear to be multifactorial and more complicated. The NOD2 protein functions as an intracellular sensor of the bacterial ligand MDP and plays an important role in maintaining the integrity of the mucosal barrier. Defective NOD2 function might possibly lead to inefficient clearance of bacterial pathogens[25,26] and the inability to respond efficiently to bacterial infection. These loss-of-function effects and an impaired antimicrobial response caused by the SNPs are stimulatory factors for GvHD development. However, NOD2 protein also functions as a positive regulator of proinflammatory responses and cytokine production. The idea that NOD2 SNPs lead to a “decreased cytokine storm” originates from the observation that the different proteins reduce the activation of NF-κB. In addition to GvHD, conditioning- or transplantation-related toxicity as a major contributing factor to the out come of HSCT has to also be taken into consideration. Although NOD2 polymorphisms were associated with other adverse outcomes (TRM, OS, DFS, or relapse), the finding was not associated specifically with the recipient or the donor. It is possible that we failed to observe such an association because of the heterogeneity in the patient population and clinical circumstances, especially with regard to T-cell depletion[6,7,9]. The implementation and method of T-cell depletion was not uniformly applied in all studies, and such inconsistencies in protocols and their application might have played a confounding role in the meta-analysis. Identifying the source of heterogeneity is one of the most important goals of the meta-analysis, in order to facilitate the detection of underlying susceptibility loci. Many clinical factors might contribute to heterogeneity, such as consistency in diagnoses, the graft source, HLA match or mismatched pairs, T-cell depletion strategy, donor leukocyte infusion administration, gastrointestinal decontamination, and GvHD-prophylaxis strategies. Stratified analysis based on these cofactors was, unfortunately, not performed due to the unavailability of detailed data. Furthermore, several limitations need to be considered in the interpretation of the results. Firstly, as with any meta-analysis, this study was limited by the quality and potential flaws of the underlying studies. Secondly, the number of NOD2 genotypes analyzed was limited and may, therefore, ultimately reduce the power of the analysis. Thirdly, all of the included trials had been performed only on Caucasian populations. With no available data on Asian and/or African populations, the results of this meta- analysis may not apply more generally to populations of diverse ethnic origins. Fourthly, some specific patient subgroups, particularly those regarding treatment protocols such as T-cell depleted versus T-cell replete allogeneic transplants, related versus unrelated donor transplants, myeloablative versus reduced intensity conditioning recipients, were not assessed due to insufficient available data. Despite these limitations, the present meta-analysis provided reliable results that the NOD2 gene might be a possible genetic susceptibility locus for adverse outcomes following HSCT. Donor NOD2 SNPs demonstrated a significant association with increased risk of severe aGvHD, but not with mild aGvHD. The impact of donor NOD2 polymorphism is likely to increase with the cumulative severity of GvHD, and it was most pronounced when coincidental NOD2 SNP/mutation occurred in both recipient and donor. The meta-analysis overall indicates that NOD2 polymorphism could be utilized to evaluate the prognosis for HSCT in the recipient. Thus, genotyping for NOD2 polymorphisms may be clinically relevant in the selection process of appropriate donors for HSCT. This work was supported by the National Natural Science Foundation of China (Grant # 81471588) and the National Hightech Research and Development Program (Program 863) of the Ministry of Science and Technology of China (Grant # 2012AA021010). All authors declare no conflict of interest in relation to the work described. No financial interest/relationships with financial interest relating to the topic of this manuscript have been declared and no conflicts that exist for each author. 1. Newman, R.G., Ross, D.B., Barreras, H., et al. The allure and peril of hematopoietic stem cell transplantation: overcoming immune challenges to improve success. (2013) Immunol Res 57(1-3): 125-139. 2. Xiao, H.W., Luo, Y., Lai, X.Y., et al. Donor TLR9 gene tagSNPs influence susceptibility to aGVHD and CMV reactivation in the allo-HSCT setting without polymorphisms in the TLR4 and NOD2 genes. (2014) Bone Marrow Transplant 49(2): 241-247. 3. Mayor, N.P., Shaw, B.E., Madrigal, J.A., et al. NOD2 Polymorphisms and Their Impact on Haematopoietic Stem Cell Transplant Outcome. (2012) Bone Marrow Res 180391. 4. Maharana, J., Patra, M.C., Pradhan, S.K., et al. Structural insights into the MDP binding and CARD-CARD interaction in zebrafish (Danio rerio) NOD2: a molecular dynamics approach. (2014) J Mol Recognit 27(5): 260-275. 5. Azzam, N., Nounou, H., Alharbi, O., et al. CARD15/NOD2, CD14 and Toll-like 4 Receptor Gene Polymorphisms in Saudi Patients with Crohn's Disease. (2012) Int J Mol Sci 13(4): 4268-4280. 6. Granell, M., Urbano-Ispizua, A., Arostegui, J.I., et al. Effect of NOD2/CARD15 variants in T-cell depleted allogeneic stem cell transplantation. (2006) Haematologica 91(10): 1372-1376. 7. van der Velden, W.J., Blijlevens, N.M., Maas, F.M., et al. NOD2 polymorphisms predict severe acute graft-versus-host and treatment-related mortality in T-cell-depleted haematopoietic stem cell transplantation. (2009) Bone Marrow Transplant 44(4): 243-248. 8. Sairafi, D., Uzunel, M., Remberger, M., et al. No impact of NOD2/CARD15 on outcome after SCT. (2008) Bone Marrow Transplant 41: 961-964. 9. Nguyen, Y., Al-Lehibi, A., Gorbe, E., et al. Insufficient evidence for association of NOD2/CARD15 or other inflammatory bowel disease-associated markers on GVHD incidence or other adverse outcomes in T-replete, unrelated donor transplantation. (2010) Blood 115: 3625-2631. 10. Gruhn, B., Intek, J., Pfaffendorf, N., et al. Polymorphism of interleukin-23 receptor gene but not of NOD2/CARD15 is associated with graft-versus-host disease after hematopoietic stem cell transplantation in children. (2009) Biol Blood Marrow Transplant 15(12): 1571-1577. 11. Jaskula, E., Lange, A., Kyrcz-Krzemien, S., et al. NOD2/CARD15 Single Nucleotide Polymorphism 13 (3020insC) is Associated with Risk of Sepsis and Single Nucleotide Polymorphism 8 (2104C>T) with Herpes Viruses Reactivation in Patients after Allogeneic Hematopoietic Stem Cell Transplantation. (2014) Biol Blood Marrow Transplant 20(3): 409-414. 12. Vigorito, A.C., Campregher, P.V., Storer, B.E., et al. Evaluation of NIH consensus criteria for classification of late acute and chronic GVHD. (2009) Blood 114(3): 702-708. 13. Whiting, P., Rutjes, A.W., Reitsma, J.B., et al. The development of QUADAS: a tool for the quality assessment of studies of diagnostic accuracy included in systematic reviews. (2003) BMC Med Res Methodol 3: 25. 15. Xing, S., Li, Z.W., Tian, Y.F., et al. Chronic hepatitis virus infection increases the risk of pancreatic cancer: a meta-analysis. (2013) Hepatobiliary Pancreat Dis Int 12(6): 575-583. 16. Ge, Y.Z., Yu, P., Jia, R.P., et al. Association between transforming growth factor beta-1 +869T/C polymorphism and acute rejection of solid organ allograft: A meta-analysis and systematic review. (2014) Transpl Immunol 30(2-3): 76-83. 17. Xing, S., Yang, J., Zhang, X., et al. Comparative efficacy and safety of mizoribine with mycophenolate mofetil for Asian renal transplantation-A meta-analysis. (2014) Clin Biochem 47: 663-669. 18. Holler, E., Rogler, G., Brenmoehl, J., et al. Prognostic significance of NOD2/CARD15 variants in HLA-identical sibling hematopoietic stem cell transplantation: effect on long-term outcome is confirmed in 2 independent cohorts and may be modulated by the type of gastrointestinal decontamination. (2006) Blood 107(10): 4189-4193. 19. Wermke, M., Maiwald, S., Schmelz, R., et al. Genetic variations of interleukin-23R (1143A>G) and BPI (A645G), but not of NOD2, are associated with acute graft-versus-host disease after allogeneic transplantation. (2010) Biol Blood Marrow Transplant 16(12): 1718-1727. 20. Holler, E., Rogler, G., Herfarth, H., et al. Both donor and recipient NOD2/CARD15 mutations associate with transplant-related mortality and GvHD following allogeneic stem cell transplantation. (2004) Blood 104(3): 889-894. 21. Ringden, O., Labopin, M., Gorin, N.C., et al. Is there a graft-versus-leukaemia effect in the absence of graft-versus-host disease in patients undergoing bone marrow transplantation for acute leukaemia? Br J Haematol 111(4): 1130-1137. 22. Maeda, Y. Pathogenesis of graft-versus-host disease: innate immunity amplifying acute alloimmune responses. (2013) Int J Hematol 98(3): 293-299. 23. Ottinger, H.D., Ferencik, S., Beelen, D.W., et al. Hematopoietic stem cell transplantation: contrasting the outcome of transplantations from HLA-identical siblings, partially HLA-mismatched related donors, and HLA-matched unrelated donors. (2003) Blood 102(3): 1131-1137. 24. Paczesny, S., Hanauer, D., Sun, Y., et al. New perspectives on the biology of acute GVHD. (2010) Bone Marrow Transplant 45(1): 1-11. 25. Biswas, A., Petnicki-Ocwieja, T., Kobayashi, K.S. Nod2: a key regulator linking microbiota to intestinal mucosal immunity. (2012) J Mol Med (Berl) 90: 15-24. 26. Amendola, A., Butera, A., Sanchez, M., et al. Nod2 deficiency is associated with an increased mucosal immunoregulatory response to commensal microorganisms. (2014) Mucosal Immunol 7(2): 391-404. 27. Sioud, M., Floisand, Y. NOD2/CARD15 on bone marrow CD34+ hematopoietic cells mediates induction of cytokines and cell differentiation. (2009) J Leukoc Biol 85: 939-946.